Natural light abounds in this truly lovely terraced garden home, located on a quiet, tree-lined street in one of the City’s finest neighborhoods. The integration of architecture, interior design & landscaping have resulted in a European style and sensibility that will be appreciated by the discerning buyer. The ease of indoor/outdoor living provides a most delightful setting for elegant entertaining and comfortable City living. The verdant outlook can be enjoyed from the expansive balconies of the upper bedroom levels as well. 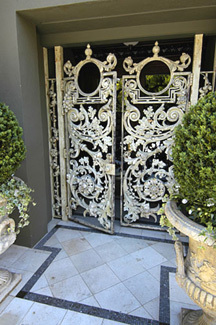 Gated entry through the beautifully ornamented 17th Century French wrought iron door; mosaic tile floor & handsome staircase to the main level. The impressive CENTER HALL introduces the fine architectural detail to be found throughout the house, including: dentil crown molding, high ceilings, exquisite lighting & beautiful hardwood floors, some with inlay. 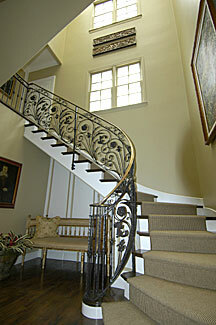 The impressive atrium staircase with wrought iron & brass work floods the house with natural light at all levels through the large skylight and side windows. POWDER ROOM & built-in wet bar opposite. The expansive LIVING/DINING ROOM features exquisite frieze work in the crown molding, marble fireplace & three pairs of French doors with decorative wrought iron balconies. The sun-filled south rooms are the heart of the house.The FAMILY/MEDIA ROOM is a wonderful, informal space for socializing with its comfortable seating area and built-in media wall system. 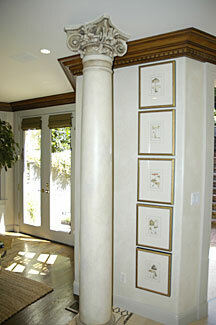 Two tall Corinthian columns and mosaic tilework delineate this space from the open custom KITCHEN. withblack granite counters, work island, ample custom cabinets & tile floor. Appliances to satisfy the gourmet cook include: 6-burner Thermador oven with grill & ventilator, Subzero refrigerator/freezer, double ovens, dishwasher, disposal, compactor & wine cooler. French doors from the BREAKFAST AREA open to the south PATIO & TERRACED GARDEN, a park-like precious setting ready to enchant and lovely to enjoy. The patio is paved in a herring bone pattern. 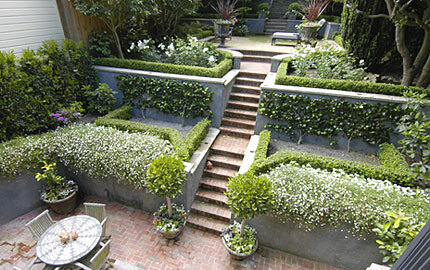 The three terraces are beautifully landscaped with a fragrant lemon tree, boxed hedges, topiaries & tree ferns. Flowering rose bushes, espaliered camellias, hydrangeas, fuchsias & agapanthus provide colorful blooms through the seasons. Bench seating & dining area may be found at mid-terrace and a lion’s head fountain is the focal point at the top of the terrace. 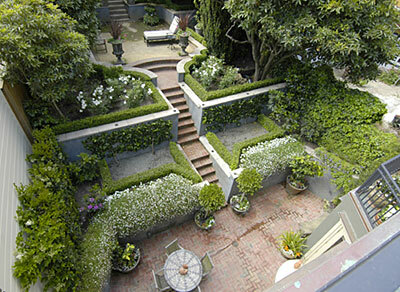 The terrace/garden setting can also be enjoyed from the expansive balconies of the upper levels of the house. 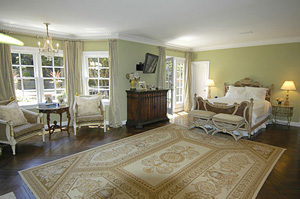 The tranquil MASTER BEDROOM with French doors open to the expansive balcony overlooking the terraced garden. 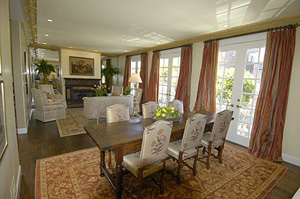 Marble fireplace, distressed wood floors in a herring bone pattern, his & her walk-in closets. Luxurious MASTER BATH with double vanity, spa tub, separate shower & limestone surround. 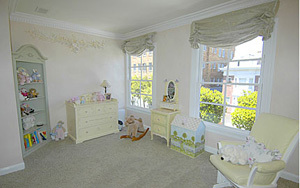 Two front BEDROOMS, one prettily decorated as a child’s room and the other, presently used as an OFFICE with handsome built-in furnishings. Adjoining BATH with pedestal sink & tub. Cozy SITTING ROOM with wet bar & paneled STUDY with fireplace & built-in bookcases. Tiled front balcony overlooks the greenery of the street & cityscape. 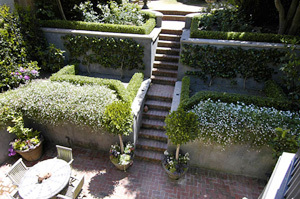 Two light-filled south facing BEDROOMS with French doors open to the expansive balcony overlooking the terraced garden. Deluxe limestone BATH with shower. Laundry room, storage & utility rooms. Two-car SIDE-BY-SIDE GARAGE with inside access.